Who knew you could create such cute garden decorations from clay pot crafts? These Darling Clay Pot Turtles are the perfect way to get your garden ready for spring. Using a variety of clay pots, this project helps you create a little turtle to place anywhere in your backyard. All you need is some bright paint to give it that final touch and you'll have the perfect piece of garden decor. It's versatile, too! Use it to hold a plant, serve appetizers, or simply add something fun to your porch or patio. Let's get crafting! Download our free eBook, 18 Projects Every Crafter Wants, to view the full project! 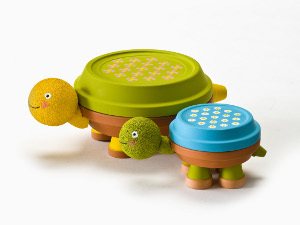 How pretty will these darling clay pot turtles look with the pretty plant on its back. I love these cute little critters and can see them all over my deck, in my garden and in my fairy garden some with plants and some just plain. I can see a hat made for a girl turtle. These are so simple and easy to make and so adorable that you will have a hard time keeping people from touching them. Great idea. These are so cute, and I think I am going to make them for my garden this spring. But I also think they would look really good on the table for our spring Pot Luck dinner at my church. You could do so much with these little characters, and they look like they would be easy to do. Thank you for such wonderful ideas to spruce up out homes. These are just too cute. I guess you could probably make any animal like this?